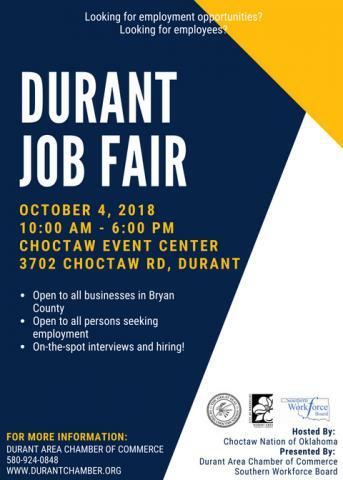 Join us for the Durant Job Fair on October 4 from 10 a.m. to 6 p.m. at Choctaw Event Center. Open to all businesses seeking employees and all persons seeking employment. More than 40 employers are ready for on-the-spot interviews and hiring! Presented by Durant Area Chamber of Commerce & Southern Workforce Board. Hosted by Choctaw Nation of Oklahoma. For more information, contact Durant Area Chamber of Commerce at 580-924-0848.